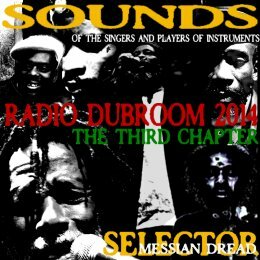 WWW, April 2014 - An ultra rare 12" by Misty in Roots, an equally out of print and hard to get 7" by Brimstone and a perhaps even more rare DUB from the online community by Kwame: just three highlights out of the third chapter of Radio Dubroom 2014. Over one and a half hour of heavyweight sounds of the Singers and Players of Instruments, including the mixing board. The set opens up with a selection of older UK Roots Reggae and DUB. As the history of Reggae in the UK is as old as the music itself, it shouldn't be too much of a surprise to find out all kinds of historic recordings that have gone lost in the memory holes of just too many people. Misty in Roots' excellent 12" "Salvation (Discomix)" and Brimstone's 7" "Final Judgement/Final Dub" are two of them. Bim Sherman brings us right into a sequence of Jamaican recordings. Heavyweight Dub Sounds from Ernest Hoo Kim as he mixes the Fatman Riddim Section, and Burning Spear with two vinyl maxi singles that many might not have heard before either, because of the rarity of exactly these 12" records. It's the kind of music you think you know, but do you really? As mentioned in the opening paragraph, included in this selection is a rare because offline -as far as we could research- track by Kwame. It's a meditative DUB that used to be available on websites from the Online (DUB) Reggae Artist Community and is simply too good to be forgotten. Massive bass and original style of mixing! Daweh Congo, Parvez and Sammy Gold are the singers in this final part of "Sounds of the Singers and Players of Instruments". Players of instruments are the Mad Professor, Vibronics, Jah Warrior out of Conscious Sounds and an online release called "Random Road", a full length free Creative Commons MP3 Album by Uptown Rebel and the French Dub Released Net Label recently reviewed in the Dubroom and available straight from this website for free.